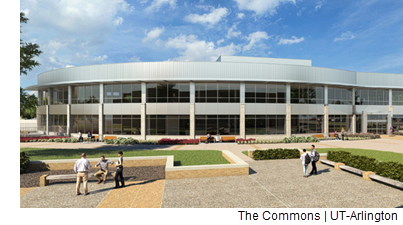 ​​​ ​ARLINGTON – The University of Texas at Arlington has opened two new buildings on the campus' west side. West Hall is a $46.5 million, 534-bed residence hall. It is the first residence hall to open at UTA since 2012. The Commons is a $21 million, two-floor, 39,000-sf dining and meeting facility. Last spring, UTA opened the 1,500-unit West Campus Parking Garage​​​​ just north of The Commons.